A Berliner  is a type of doughnut from Germany and Central Europe. They are made from sweet yeast dough fried in fat or oil, with a marmalade or jam filling and usually icing, powdered sugar or conventional sugar on top. They are sometimes made with chocolate, champagne, custard, mocha, or advocaat filling, or with no filling at all. The filling is injected with a large syringe after the pastry is fried. The name of the doughnut is different in various areas of Germany. While most areas call it a Berliner, residents of Berlin, Brandenburg and Saxony know them as Pfannkuchen, which in the rest of Germany generally means pancakes - pancakes are known there as Eierkuchen (lit. egg cakes). 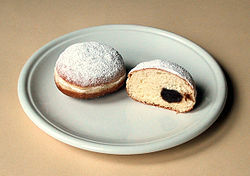 In parts of southern and central Germany (Bavaria), as well as in much of Austria, they are a variety of Krapfen; in Hessen they are referred to as Kräppel or Kreppel, or, in Palatinate, Fastnachtsküchelchen (literally: "little carnival cakes"). In South Tirol part of northern Italy, the food is called krafen or krapfen. In Slovenia, it is krof; in Croatia krafne; in Bosnia, and Serbia krofne. In Poland they are known as pączki, in the Czech Republic as kobliha. In Hungary, it is called fánk. All of these are essentially identical preparations. In English-speaking countries, Berliners are usually called doughnuts and are usually filled with jam, jelly, custard or whipped cream. However, in South Australia, the Kitchener bun is a Berliner cut on the side for the filling of jam and cream. In Anglophone North America, the most common term for the jam- or jelly-filled pastry is "jelly doughnut". The name is somewhat misleading, since the jam or jelly used is specially made with less pectin, so that it does not "set" like jams and jellies manufactured for table use but has a consistency comparable to Bavarian cream. The cream or custard-filled variety usually also feature chocolate icing and are sometimes called Bavarian cream or Boston cream doughnuts (the latter name from its resemblance to Boston cream pie). The Boston cream doughnut has been designated the official state doughnut of Massachusetts. In Ontario and the prairie western provinces of Canada, as well as parts of the Midwest in the U. S., such a round jelly- or custard-filled doughnut is commonly called a "Bismarck," while a filled bar doughnut is called a "Long John", and usually contains pastry creme, custard or whipped cream but can contain a jelly filling. Other Canadian terms include "jambuster" in Manitoba, and "Burlington bun" in Nova Scotia. Berliners are traditionally eaten to celebrate on New Year's Eve (Silvester) as well as the carnival holidays (Mardi Gras). A common German practical joke is to secretly fill some Berliners with mustard instead of jam and serve them together with regular Berliners without telling anyone. In Portugal, berliners are slightly bigger than their German counterparts. They are known as bolas de Berlim (Berlin ball) and the filling is always an egg-yolk based yellow cream called creme pasteleiro (lit. confectioner's cream). The filling is inserted after a half length cut and is always visible. Regular sugar is used to sprinkle it. They can be found in almost every pastry shop in the country. Such versions are also found in Latin America, in Chile, Uruguay and Argentina, where it's not only filled with custard (called "Crema pastelera"), but with jam (especially red ones) or manjar blanco. In Brazil, berliners are called sonhos (dreams) and traditionally filled with yellow cream (called simply creme). Some modern variants filled with doce de leite (a type of milk jam), or a mix of chocolate and doce de leite, can be found in Rio de Janeiro's bakeries. In Israel, a version of the pastry called sufganiyah is traditionally eaten during the holiday of Hanukkah. While sufganiyot are usually filled with jam, many modern variants exist. Wikimedia Commons has media related to Berliner. This page was last changed on 18 November 2014, at 12:01.